What are the movement patterns ? Which modes of transport are used ? Which routes ? 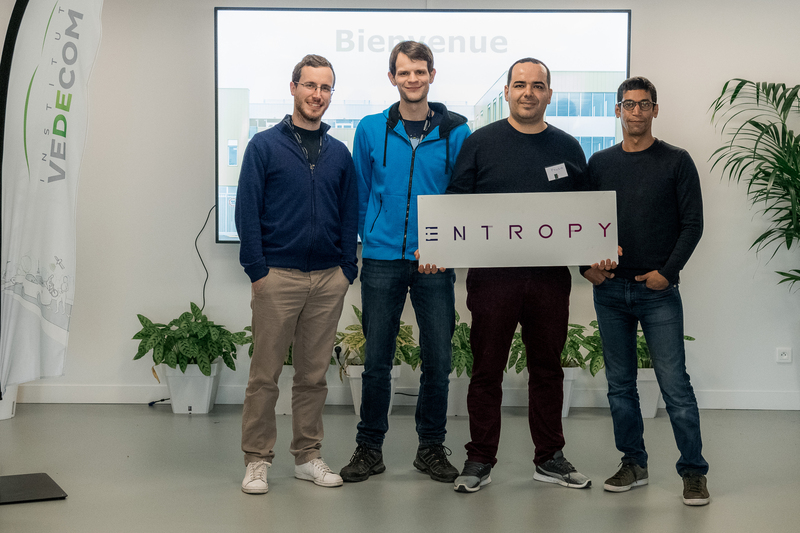 Entropy, the new start-up stemming from the VEDECOM Institute’s research work, offers communities as well as individual actors a tool for understanding, measuring, and analysing all mobility requirements within a given territory. By means of an artifical intelligence which models flows, Entropy makes it possible to acquire detailed knnowledge of a territory’s mobility in order to make decisions on and evaluate the necessary facilities or services, bypassing field surveys. Entropy provides predictive multi-sources software that uses wide-ranging data sources : GPS from cars, demographics, transport networks…A display interface enables the observation of all journeys made within a territory during a standard 24-hour day on an interactive map. 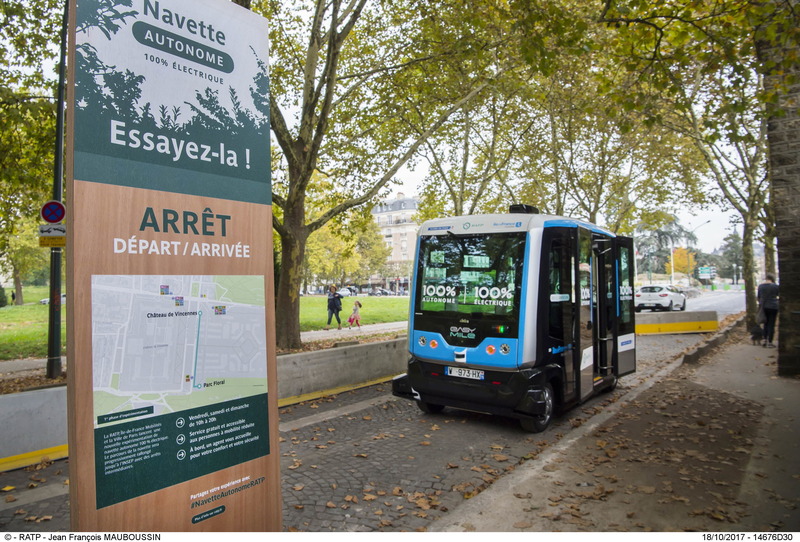 The use of artificial intelligence has many advantages : reactive, the Entropy’s tool provides 100% coverage in France, and is as accurate as face-to-face field surveys, but at lower cost. The startup has set an ambitious objective : to establish itself by 2022 as the leader in demand estimation for mobility managers in France. 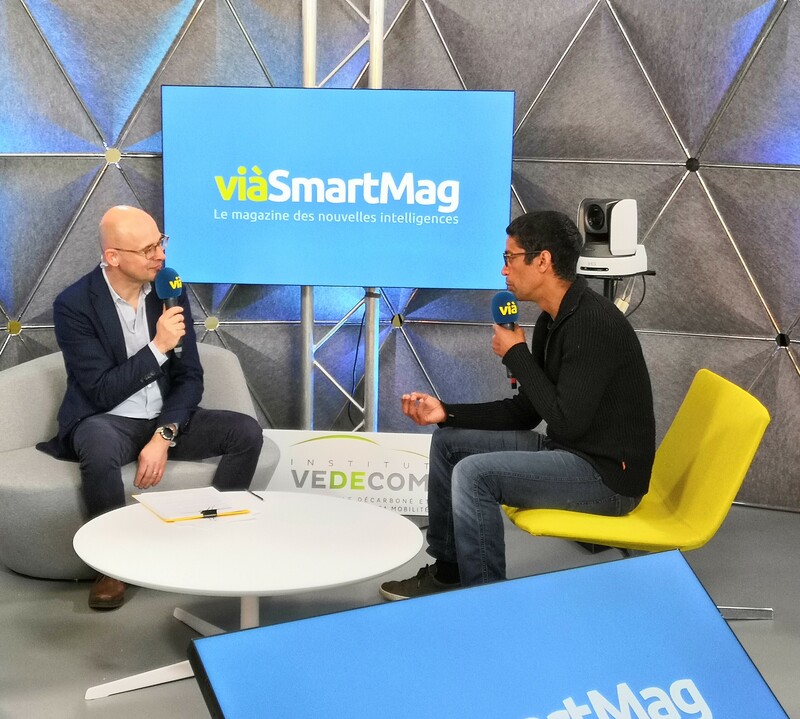 The 2019 mobilité@VEDECOM event took place on Thursday 11 April 2019 at the mobiLAB, attended by over 400 guests. 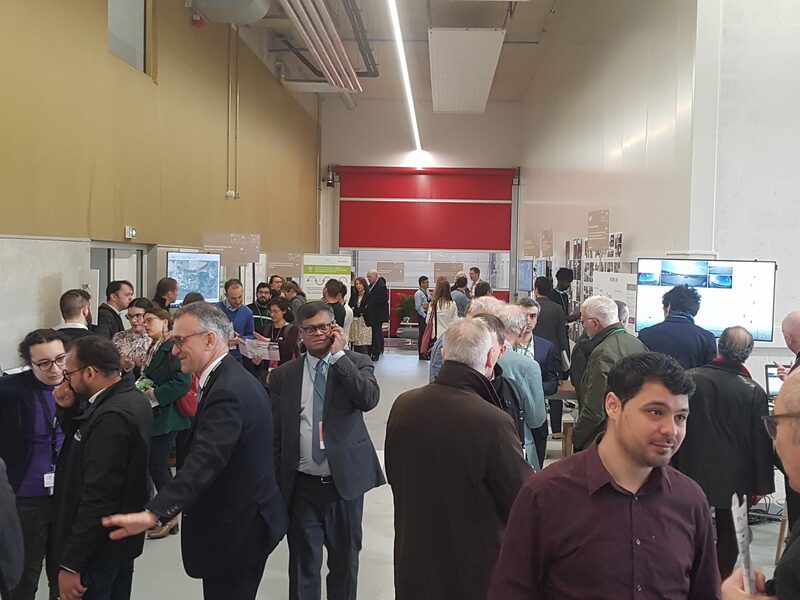 To mark its fifth anniversary, the Institute for Energy Transition presented a wide range of research projects and results at 40 dedicated stands. 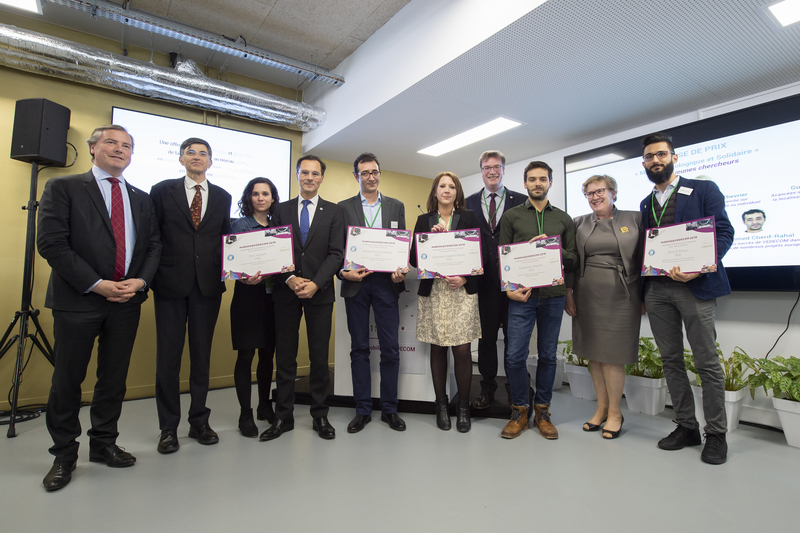 It was an opportunity to award the Ecological and Inclusive Mobility Award to five of its young researchers at a ceremony attended by representatives of the French state and VEDECOM’s partner municipalities. It was also an opportunity to invite 10 startups from the world of mobility to MOBILITY SPOT – a combination of a hub, a fablab and prototyping workshops. We take a look back at this day of discoveries, meetings and shared experiences to uncover the secrets of the future of mobility. 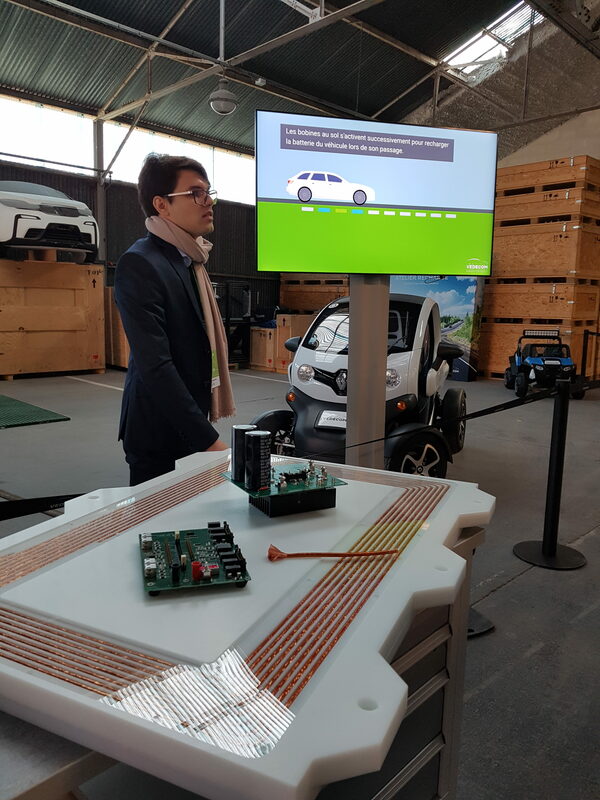 The Institute’s three fields of research were in the spotlight at the fifth mobilité@VEDECOM event – vehicle electrification, self-driving and connectivity, and shared mobility and energy: three different fields bringing cross-cutting and systemic expertise in autonomous vehicles and mobility. R&D has been extended to include a training programme to share VEDECOM’s knowledge and encourage the development of skills among stakeholders in the mobility ecosystem, demonstrated via a number of lively events. Researchers also gave introductions to the innovative solutions put in place within the Institute: Entropy, the first startup created following a VEDECOM research project; demonstrations of the level 4 and 5 autonomous vehicle; Geloca, the vehicle localisation solution that uses land registry maps; MOOVE, the project for collecting driving data; the new 30 kW roadside induction coil charging stations; autonomous shuttles with expanded perception; pedestrian and driving simulators; and many more. 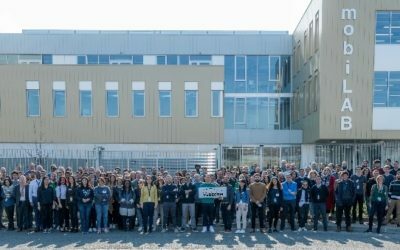 For the first time, the event took place within the Institute itself, between the mobiLAB and Hall A, at the edge of the test tracks. With the sun shining, visitors moved from demonstrations to conferences, from themed trails to workshops, and from simulators to autonomous shuttles. These visits were an opportunity to discuss topics ranging from artificial intelligence to road markings, from acceptability to mobile hyperplaces, from thermal comfort to embedded PMB, and more. 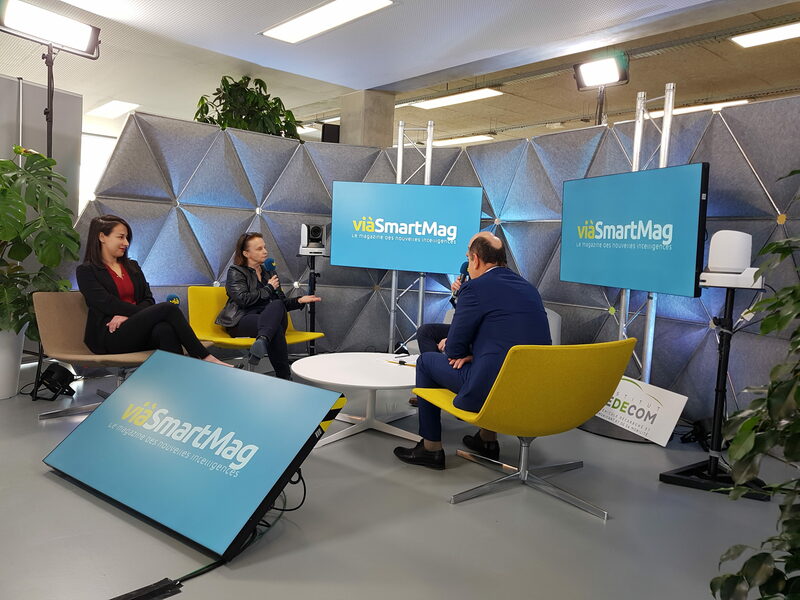 The vià GrandParis studio, located right in the middle of the reception area and hosted throughout the day by journalist Olivier Zanetta, held a range of interviews, putting the experts in the limelight. Debates featuring VEDECOM researchers and external guests were a chance to highlight the crucial questions that will shape the future of mobility. How can recharging and energy distribution – so essential to the development of electric vehicles – be managed? What challenges will arise during the roll-out of autonomous vehicles, aside from the vehicles themselves? How can we train ourselves in future forms of mobility, which will involve the transformation of existing jobs and the creation of new ones? What methods of travel will we use in the future ? As a first step towards tackling all of these questions, a village of guest startups presented their innovative mobility solutions and services: Oribiky, the first eco-friendly self-service solution for electrically assisted cycles; Trialog, an engineering consultancy and expertise company that is involved in work to standardise communications between electric vehicles and charging stations; VOOX, which has designed a patented innovative technology that aims to simplify the exchange of data in industrial systems; Box2Home, which offers last-mile delivery solutions to businesses and professionals for heavy and/or large parcels; LCN, an engineering firm that works on real-time management of crossroads; and finally Cocoon, the three-wheeler with a passenger compartment from BlueMooov, which is particularly well-suited for urban journeys and which was previewed at the show. The high point of this anniversary year was the recognition of five young VEDECOM researchers for their scientific advances in the field of new forms of mobility. Roch El Khoury, Guillaume Bresson, Stéphanie Coeugnet-Chevrier, Mohamed Cherif Rahal and Elsa Yousfi received the Ecological and Inclusive Mobility Award from the Secretary-General for Investment, Guillaume Body, as well as from François de Mazières, mayor of Versailles and chair of Versailles Grand Parc, Olivier de La Faire, Yvelines departmental councillor, and Sylvie Piganeau, regional councillor. “We want to celebrate these young researchers who are the driving force behind all of these innovations that will change our lives and make us safer,” said Guillaume Body. It is also an opportunity to set three new challenges for VEDECOM: forge closer bonds with technical research institutes, strengthen partnerships and carry out the process of energy transition for future generations. “Our 200 engineers and researchers work on a daily basis to bring about the future of mobility – a sustainable mobility. As an Institute for Energy Transition, VEDECOM is at the heart of the environmental and ecological revolution in the field of transport,” added Philippe Watteau, the Managing Director of the Institute. He also expressed his thanks to all VEDECOM teams in this anniversary year. The Institute is proud of its successes and confident about its future. VEDECOM is ready to embrace the next five years, which will feature three development focuses: entrepreneurship, consolidating VEDECOM’s role as an accelerator of innovation in the field of new forms of mobility at the Satory hub, and enhancing international awareness of the Institute’s research activities. Roch El Khoury is an engineer who received his doctorate in energy and processes from the École des Mines de Paris in 2015. Roch joined VEDECOM in 2015 to extend the results of his doctoral research, in digital simulation, to electric vehicles. He currently heads the research team working on passengers’ thermal comfort and optimising its impact on the driving range and energy consumption of electric vehicles. Guillaume Bresson received his doctorate in mobile robotics from Université Blaise Pascal (UBP), France, in 2014. He was a post-doctoral student at Inria Paris-Rocquencourt, working on issues of perception for smart transport systems. He joined the VEDECOM Institute in 2015, where he has led work on the topic of localisation and mapping since his arrival. He is also joint project manager on the Automated Driving Vehicle project at the Institute. Stéphanie Coeugnet – After receiving her doctorate in psychology and cognitive ergonomics from the University of Valanciennes in 2011, she joined VEDECOM in 2016 after four years of post-doctoral work on the design and assessment of MMIs. She manages VEDECOM’s research topic into the acceptability and ease of use of new mobility solutions and their MMIs. Mohamed-Cherif RAHAL. After receiving his doctorate in theoretical computer science from Paris Dauphine University in 2010, he moved to IFSTTAR for a post-doc, where he worked on issues of road-edge detection to improve traffic flow. He joined the VEDECOM Institute in 2013. He is currently a researcher working on autonomous vehicle perception and he is also the joint project manager of the Automated Driving Vehicle project. He leads three European projects (AUTOMATE, ADAS&ME and CoExist). Elsa Yousfi joined the human factors team at the VEDECOM Institute in 2014 to begin her cognitive psychology thesis on human drivers retaking control of autonomous vehicles. She then continued her work within the Institute as a post-doctoral researcher into human factors as part of the European AutoMate project. She is currently head of psychological research and studies human behaviour on board autonomous vehicles. 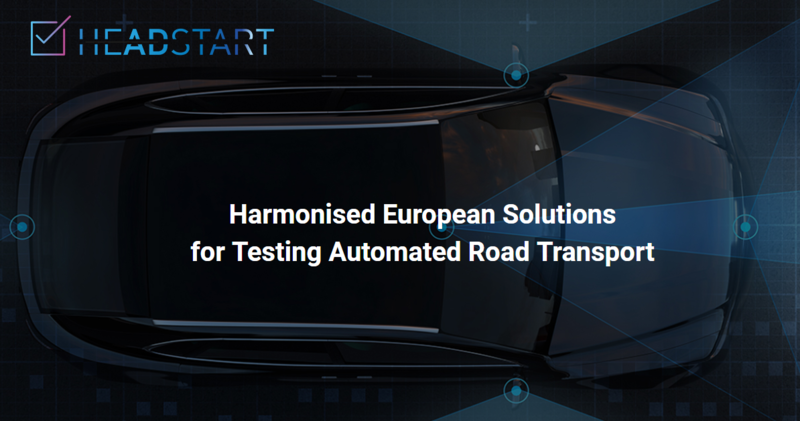 H2020 European project HEADSTART (Harmonised European Solutions for Testing Automated Road Transport) was launched in January 2019. It is deployed by a consortium of 21 partners, from 9 different countries, one of which is VEDECOM Institute, under the coordination of IDIADA and Mr Álvaro Arrúe. The consortium’s vision is to define testing and validation procedures of Connected and Automated Driving functions including key technologies such as communications, cyber-security and positioning. The tests will take place in simulation and real-world fields with the aim to validate safety and security performance according to the key users’ needs. 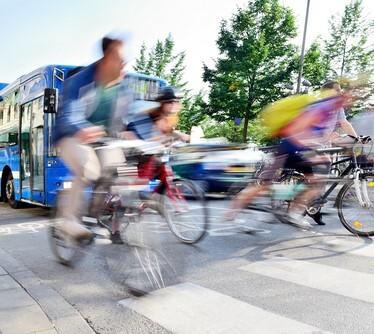 The HEADSTART project will bring together the consortium with other European and national CAD stakeholders to cluster the most relevant existing initiatives, develop methodologies, procedures and tools and drive in a harmonized European solution for testing and validation of automated road vehicles. Within the lifetime of the project, relevant stakeholders will be able to join the experts’ network so as to configure together the methodologies used and also promote the project results’ adoption. Within the consortium, VEDECOM is responsible for the first work package (WP1) with the objective of establishing the state of the art on testing and validation methodologies, identifying the needs of stakeholders, defining the requirements for key technologies and selecting the most relevant use cases in various traffic scenarios to be tested on proving ground or simulation for Connected and Automated Vehicle (CAV) certification. VEDECOM is also contributing to WP2 to define a methodology for CAD testing and validation for the targeted use cases, taking into consideration the key technologies. This project has received funding from the European Union’s Horizon 2020 research and innovation programme under grant agreement No 824309. The inauguration of the trinational digital test bed took place on Wednesday, April 3rd 2019, in Schengen (Luxembourg). On this occasion, VEDECOM presented the TRIICA project, whose main goal is to demonstrate the continuous compatibility for communicating vehicles with driving delegation between three countries in relationship with the infrastructures. The event took place in the presence of the ministers of Transport of France, Germany and Luxembourg, as well as the Luxembourgish deputy prime minister and the minister of Transport of the Saarland. The creation of the site reflects the common will of the three countries to promote the development and experimentation of various technologies for automated and connected driving in a real-world and cross-border context. Philippe Watteau, CEO of the VEDECOM Institute, took the opportunity of the event to present the TRIICA project (Test and Research on Intelligent Infrastructure for Collaborative Autonomous driving) which was set up by VEDECOM in response to the Call for Expression of Interest published by the Ministries of the three countries in 2018. The project is coordinated by VEDECOM and carried by a consortium of 6 French partners (Cerema, Sanef, YoGoKo as well as the French subsidiaries of 3M and Continental). They aim to further extend the consortium to German and Luxembourgish partners. 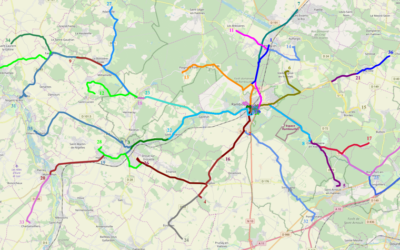 TRIICA project’s main goal is to demonstrate the continuous compatibility for communicating vehicles with driving delegation between three countries while valorising the benefits of road infrastructures for the development of automated driving technologies. The first step will consist of detecting and analysing for each country different specific road signalling types, leveraging vehicles with perception capabilities that are representative of level 4 connected autonomous vehicles. This comparison will allow to identify risk situations generated by specificities of cross-border context. Horizontal and vertical innovative road signalling will be tested to assess their potential additional value for autonomous driving vehicle. Continuity of the connectivity management (roaming) in cross-border regions will also be considered. To conclude this first use case, specifications and recommendations will be issued to guide the development of vehicles with driving delegation and their infrastructures. The second step will aim to widen the AD vehicles’ perception by eHorizon which is a cloud service enriched by a local dynamic map (LDM) giving the opportunity to inform the vehicle of risk situations leading to a decrease of the current SAE level. The capacity of the vehicle to initiate a fall back safe-stop manoeuvre in an informed refuge zone will therefore be considered. In a last step, a new prototype vehicle with driving delegation, designed by VEDECOM, will integrate specifications developed in previous use cases. This will allow to demonstrate the various driving situations considered in the first steps. As the project coordinator of TRIICA, VEDECOM will be leading the different research and development activities as well as the experimentations and evaluation.